Poetry on the Move: An official commendation! 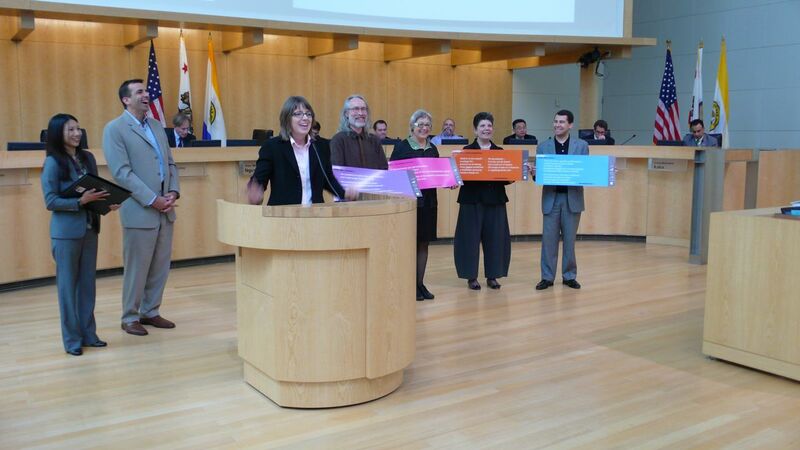 Here I am with project artist Joe Miller receiving our commendations from the City of San Jose for our work to bring Poetry on the Move to VTA for National Poetry Month. Joe holds the purple car card, and members of the Arts Commission are holding the others. Vice Mayor Nguyen and Councilmember Sam Liccardo are on the left. Why is everyone laughing? Are City Council meetings always this fun? I have just described to the audience that the competing poets had to limit their poems to 50 words or less, and suggested that the City Council try the same thing sometime. Guess I struck a nerve. Joe and I are grateful for the project’s success and appreciate the honor bestowed. Outstanding! You make all of us proud! Way to bring poetry to the fast-moving Silicon Valley!